BUYSOUNDTRAX Records will be releasing THE MOLE – MUSIC FROM SEASON FIVE. The album features music composed and conducted by David Michael Frank (ABOVE THE LAW) for the Fifth season of the popular reality show, THE MOLE, broadcast on ABC in 2008. THE MOLE is based on the original series DE MOL, produced in Belgium. Regarded as “the smartest reality show ever”, the premise of the show is for at least ten players to gather and participate in various tests (games, physical challenges, puzzles, etc.) to try to earn money for a cash pot that can increase up to a maximum of $1,000,000. One of the contestants is a mole, out to sabotage the games and prevent money from being added to the pot while avoiding or deflecting suspicion. The game continues in each episode until only three players are left. Two contestants and the mole. The contestant who scores the highest on the final quiz wins the game and the entire cash pot. For DE MOL, the show would frequently use musical excerpts from well known film scores by John Williams, Bernard Herrmann, Hans Zimmer and others. To license the same music here in the United States would be cost prohibitive therefore the producers chose to engage the services of David Michael Frank to compose a musical library for the U.S. version of the show. A previous volume of music for THE MOLE was released by Varese Sarabande in 2000 and included music that was used in the first four seasons of THE MOLE and CELEBRITY MOLE. The producers of the show hired Frank again in 2008 to record an entirely new orchestral score for the show and the music was recorded in March 2008, performed by the Moscow Symphony Orchestra, with some additional electronic sweetening later in Los Angeles. 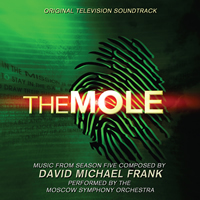 Frank’s orchestral score for Season Five of THE MOLE is an excellent showcase for the composer’s many fine talents and listeners who may only be familiar with the scores for his earlier action films will be overwhelmed by his new work presented on this album. David Michael Frank was born in Baltimore, Maryland, where he studied piano and composition at the Peabody Conservatory of Music and was a soloist with the Peabody Orchestra at age sixteen. Since moving to California in 1978, Frank has been a prolific composer in many different genres. He has worked for directors such as Andrew Davis, Keenen Ivory Wayans, Wes Craven, William Shatner and Robert Townsend. Frank has composed the music for over seventy five feature, cable and television films, including ABOVE THE LAW, HARD TO KILL, OUT FOR JUSTICE, I’M GONNA GIT YOU SUCKA, POISON IVY, SHOWDOWN IN LITTLE TOKYO, THE STAIRCASE, A KID IN ALADDIN’S PALACE and the IMAX film, COSMIC VOYAGE, among others, as well as several hundred episodes of various primetime series. He has earned three national Primetime Emmy nominations in three different categories. Recent projects include the feature film, SHERMAN’S WAY, and the documentary, MARY PICKFORD: THE MUSE OF THE MOVIES.